Don’t try to market-time in the midst of chaotic or scary events. This valuable investment lesson was new to some and a reminder to others in 2014. We have seen a number of shocking events and crises this year. They include the tragic shooting down of a Malaysia airliner, the emergence of ISIS as a brutal and destabilizing force in the Middle East, and the spread of the truly frightening disease, Ebola, throughout much of West Africa. Taking a closer look at the downing of the Malaysia airliner, it was shot down on July 17, 2014. The market took this event in stride. For the entire year so far, U.S. stock markets have performed strongly in spite of these horrifying events. Even when we look at truly traumatic events that occurred in other years the lesson still stands. 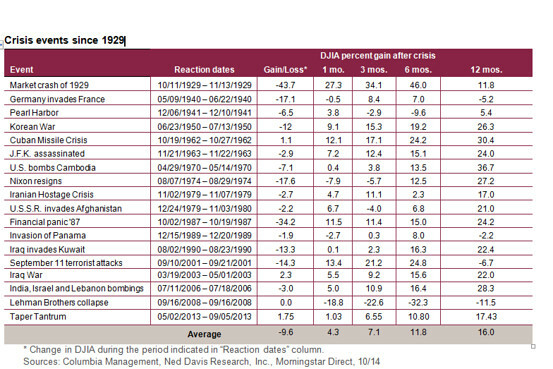 The chart below lists a number of events and shows us the effect on the Dow Jones Industrial Average 12 months later. In almost all cases, the DJIA was up at the end of that period. Clearly, it is difficult to predict the effect such events have on financial markets. However, if investors can stay disciplined and calloused to the volatility, their portfolios should be rewarded in the long term.